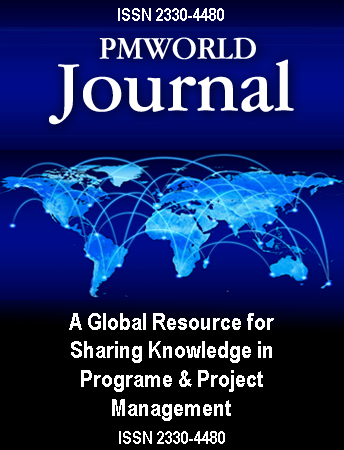 This article extends the scope of the Earned Value method beyond its traditional focus on budgeted cost, to encompass benefit-value, and support the strategic dimension of projects. Wayne Abba, the past chairman of the College of Performance Management, made me aware of an article of his [Abba W. 2008] that is included in the Project Manager’s Handbook [op. cit.]. Among the interesting facts about the development of Earned Value Management (EVM) and its application in U.S. Federal Government projects, he provides a definition of EVM from the Electronic Industries Alliance Standard EIA-748-B [EIA, 2019]. As will be explained below, this definition got me thinking about a posible, compatible extension of the current EVM paradigm that would provide a stepping-stone between project Earned Value and program Earned Benefit as it has been described in the current series. The Earned Benefit model has been developed and explained over a number of articles in the current series [Piney 2018a]. Piney [2018b] [“Benefits Maps You Can Count On”] starts off by describing the basic concepts of benefits maps (also called Benefits Realization Maps (BRM)) and applying them to a case study. what we need to do to create the tools (“initiatives” or “component projects”). This set of steps can be read in the reverse direction – starting from the initiatives – to explain why each step is necessary: from project to deliverables, to the capabilities of these deliverables, to the outcomes of applying the capabilities, and, finally, to the benefits associated with the outcomes. The concept of “disbenefits” is also included in order to cater for negative side effects due to the planned steps or the end-result of the program. Each of these steps is represented in the BRM by a “node”. The links between nodes are represented by arrows to indicate the logical flow from cause to effect. The initiatives are drawn on the left and the logical chain is read from left to right, across to the strategic benefits, although, as explained above, the BRM is built up from right to left, starting from the end-goal represented by the strategic benefits required. In this way, reading from left-to-right, the BRM provides the tactical view of the program; the logic of the strategic plan is developed from right to left. The elements of the map can then be quantified. Piney [2018b] explained the concepts of a) “contributions” – the amount a given BRM node contributes to the overall benefits –, and b) the corresponding “allocations” – the amount of investment that is required to deliver the node’s result –. The proportion of a node’s total contribution provided by a direct predecessor is defined as the “contribution fraction” and assigned to the corresponding link. The algorithm by which this information can be used to calculate the contributions in all of the nodes in the BRM was described. This algorithm is known as the Benefits Allocation Routine (BAR) and diffuses contributions from right to left across the BRM. These ideas are explained based on a representative case study. The business objective of the program in this example is to increase profits for an organization in the area of customer service. The premise of the case study is that strategic analysis by senior management has shown that increased customer satisfaction with after-sales support enhances business results and has the potential for delivering additional revenue of €300,000 per annum compared with the current level of business. However, this service will also lead to an increase in operational costs amounting to 25% of the corresponding financial improvement, thereby reducing the net benefit by that amount. The corresponding BRM after applying the BAR is shown in Figure 1. Editor’s note: This series is by Crispin “Kik” Piney, author of the book Earned Benefit Program Management, Aligning, Realizing and Sustaining Strategy, published by CRC Press in 2018. Merging treatment of program management, benefits realization management and earned value management, Kik’s book breaks important new ground in the program/project management field. In this series of articles, Kik introduces some earned benefit management concepts in simple and practical terms. After many years managing international IT projects within large corporations, Crispin (“Kik”) Piney, B.Sc., PgMP is now a freelance project management consultant based in the South of France. At present, his main areas of focus are risk management, integrated Portfolio, Program and Project management, scope management and organizational maturity, as well as time and cost control. He has developed advanced training courses on these topics, which he delivers in English and in French to international audiences from various industries. In the consultancy area, he has developed and delivered a practical project management maturity analysis and action-planning consultancy package. Kik has carried out work for PMI on the first Edition of the Organizational Project Management Maturity Model (OPM3™) as well as participating actively in fourth edition of the Guide to the Project Management Body of Knowledge and was also vice-chairman of the Translation Verification Committee for the Third Edition. He was a significant contributor to the second edition of both PMI’s Standard for Program Management as well as the Standard for Portfolio Management. In 2008, he was the first person in France to receive PMI’s PgMP® credential; he was also the first recipient in France of the PfMP® credential. He is co-author of PMI’s Practice Standard for Risk Management. He collaborates with David Hillson (the “Risk Doctor”) by translating his monthly risk briefings into French. He has presented at a number of recent PMI conferences and published formal papers.